Sleep Out or Sleep In–It’s Up To You! Sleep Out or Sleep In: Join the movement that stands apart and register for Sleep Out Saturday! This year, you and your group can collect pledges and Sleep Out as an individual or group in solidarity with homeless families; or, you can Sleep In and fundraise in the spirit of helping our most vulnerable families, and focus on the issues of homelessness without sleeping outside on November 5. We Don’t Just Sleep Out–We Rock Out: You and all your friends and neighbors are invited to join us at a live community benefit concert in downtown Glen Ellyn! The concert begins on November 5 at 6 PM, featuring the School of Rock Glen Ellyn and additional guests, leading into the fun-filled and inspiring Sleep Out Saturday rally, with testimonials from Bridge families and more. P.S. Busing to the concert is provided for groups from your Sleep Out site and back after the show! You are Making #HomelessNoMore a Reality: Every dollar raised from Sleep Out Saturday directly assists homeless families in the Bridge Communities transitional housing program, funding the housing, employment training, mentoring, case management, plus tutoring and other programs for homeless children. YOU are giving them the tools so they will recover from the trauma of homelessness, and never become homeless again! If you have already registered your group–thank you! And if you have not done so yet, we hope you’ll join us at Sleep Out Saturday on November 5. Please contact chad.pedigo@bridgecommunities.org or 630-545-0610 x19 with any questions. 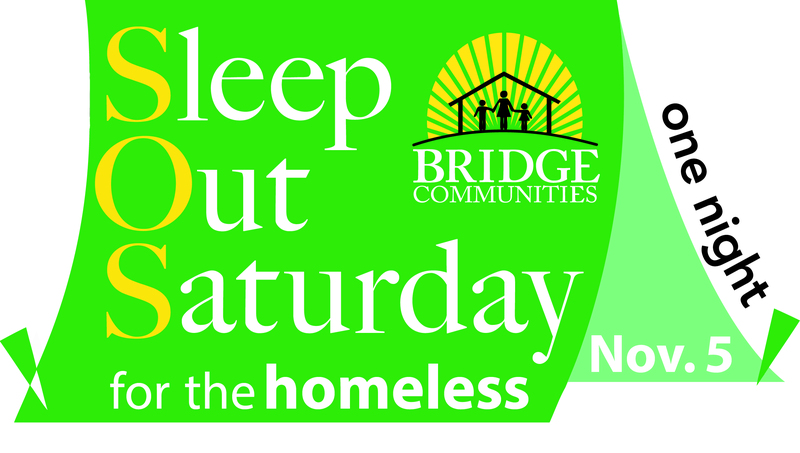 Bridge Communities is excited to welcome you to Sleep Out Saturday 2016!